ALIVE & WELL is a documentary film about the human condition, which follows seven resilient characters coming to terms with the reality of living with Huntington's Disease (HD); a hereditary illness that is called the most devastating disease known to man. Far from giving us a hopeless glimpse into life with terminal illness, ALIVE & WELL reminds us of our ability to persevere with strength, despite life's most difficult challenges. 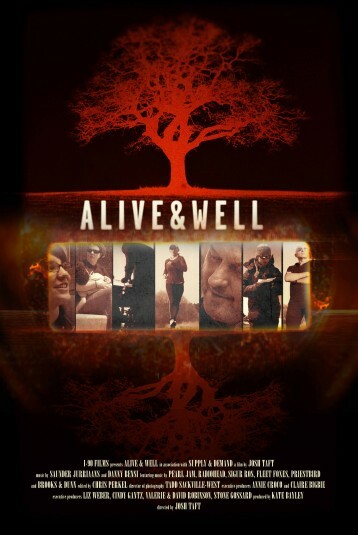 ALIVE & WELL features original music by composers, Saunder Jurriaans and Danny Bensi of Stenfert Charles. Additional music for the film was provided by Pearl Jam, Radiohead, Sigur Rós, Fleet Foxes and Priestbird. HUNTINGTON’S DISEASE (HD) is a hereditary, degenerative neurological disorder that has been called the most devastating disease known to man. After adult onset, 15-20 years of slow, painful mental and physical deterioration occur. For children who have the juvenile form of Huntington’s, the decline is severely accelerated.